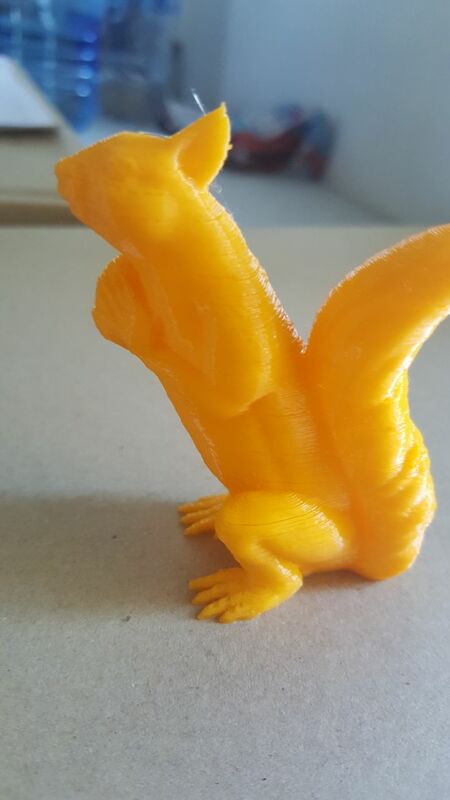 i am new to 3d printing and am struggling with print quality. i get lines on only 1 side of my prints and cant seem to figure out what the problem is.it almost looks like its missing part of the layer but the the rest of the print looks very good. i checked bed level, flowrate etc. and even secured my printer to a table incase its vibration related but nothing works. i am using a prusa i3 clone. any suggestions of what ican try will be appreciated. Would it be possible to include some pictures of the problems? It almost sounds like your extruder drive is slipping. Could be a loose set screw, or motor reaching its torque limit, or it could be bad filament (too thick diameter) that is having a hard time to fit in. Hope that helps… maybe able to shed some light on it more with pics. Here is another one. The problem is always on the same side of the print. The other side looks great. That’s called under extrusion. First thing I would try upping flow rate. Many different things can causes this. #1 cause bad filament, check to see if your filament is constant size . next heater, extruder motor, software. Yes, definitely under extruding and as @DeathMachine has mentioned it could be something as simple as flow rate but more than likely it is something stopping the filament from traveling evenly into the hotend. I’ve had bad filament before that was over tolerance in only parts of the roll so it would jam up inside the hotend entry. It could be cleanliness of the extruder itself, the drive wheel can be packed with plastic and it doesn’t have any grip left so the wheel is slipping on the filament. Slipping on the filament could be a sign of over extrusion as well because the extruder is trying to push more filament that it can which develops back pressure until the drive wheel digs into the filament. Some drive wheels only have one set screw so it is easy for them to slip on the motor shaft. You can try and slow your print speed right down and see if that helps. That would indicate to you if it is a back pressure issue. Make sure your nozzle is clean as well. That is another cause of back pressure and under extruding. thanks. i think the back preassure thing might be the culprit. i decreased my extrusion multiplier and its a lot better. now i need to fine tune it . on another note, i bought the printer with a 0.4mm nozzle and never measured the filament that it extrudes. i checked this now and i am getting 4,5mm strands coming out of the nozzle. will that make much of a difference ti my settings if cure is set up for a 0.4mm nozzle? agian thanks for the info . Are you running a bowden setup or direct drive? If it is bowden, you can just pull the tubing out from the hotend, cut the filament flush with the tubing, then extrude 100mm or so and measure for accuracy. Direct drive is a bit more trouble but you can pull off the hot end and snip off the filament at a point you can reference its starting point then extrude and measure. If that checks out then your back pressure is caused by something else, ie, semi blocked nozzle or bad filament. I would also look at cooling. Because it only does it on one side of the print I would think that was the side your fan was hitting mostly and cooling too much such that the material isn’t flowing and sticking enough. Try upping the temp 5°C and see what happens. hi thanks. i have direct drive. when i calibrated it , it fed 100mm when i asked for 100mm so i think its the filament. i was using the orange pla and changed to a black pla i also have and after pushing up the temperature to 200 from 190 it seems a lot better. now i only get the lines around 50mm up when printing. i slowed down the print speed as i was thinking maybe the object is moving to fast and flexing to cause the problem. i made sure my belts are tight as well. so far it looks better but i have to print at around 20mm/s to get good results on tall objects with small footprint. is there any way to improve my printer to be able to speed prints up a bit. i was thinking to change the eaxtruder setup to bowden type but the moving hotbed will still be a problem as i can not reduce the weight there. thank you. that might be part of my problem as i was thinking more cooling is better for pla. i pushed the temp up to 200 from 190 and its definately better. more cooling is better for PLA, but you must get it to flow and stick together first. The temp must be set taking into consideration speed, material, nozzle size, etc. If I am printing fast I will increase my temp. I generally run 205 first layer and 200 after. I have a lot of cooling. My printer is a corexy so the bed does not move. The first toy I had was a Cartesian and SLOWWWW was the only way. 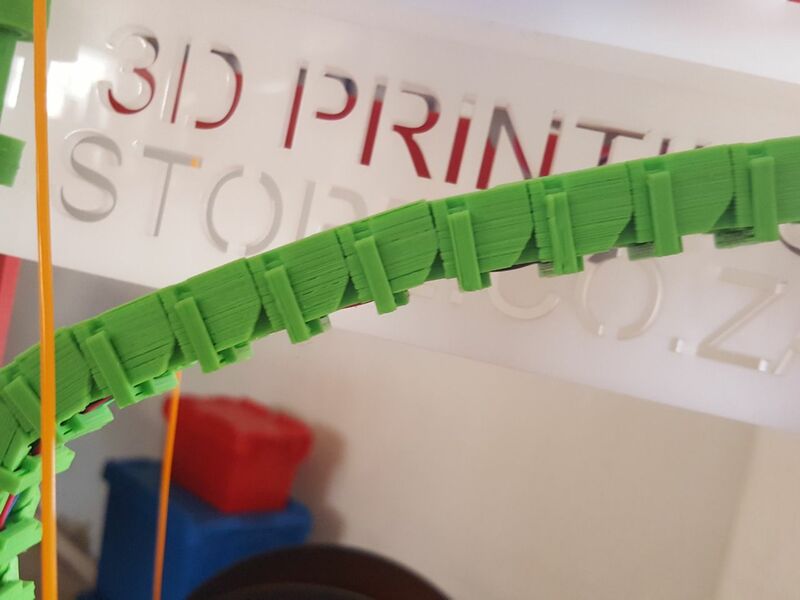 If the bed movement effects your print it will show as waves and misalignment of the layers on all sides. Not the issue in this thread. Jerk and acceleration settings will cause specific problems like overshoot in corners or bubbles on a face. Each issue must be dealt with separately. It all comes with being able to analyze the problem and experience. small objects like an Eiffel tower model must be printed slow. Detail goes away as speed rises and trying to lay hot material on top of hot material just creates blobs. That is why slicers reduce speed as the print cycle (time on one layer) goes down. The longer cycle lets the base layer cool.